Well its time to say good bye to your native SMS App on Android and install the newly updated Textra. This amazing App is a SMS and MMS client built into one. And Android allows the user to install App of his or her choice. As I have said above, Textra is free, unique and a complete replacement for SMS and MMS needs once you can disable your stock Messaging app and replace it with this one. It has tons of great and interesting features like 800 + emoticons or emojis, quick reply popup, and better MMS and group messaging etc. 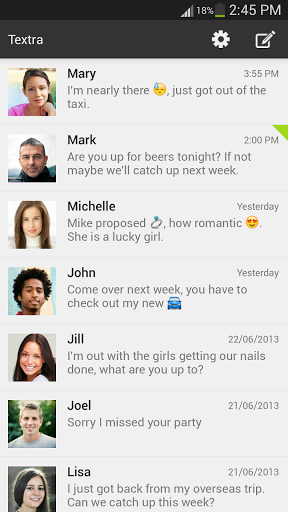 You can also make your SMS experience livelier by customizing the chat bubbles colour and notifications. This can be done to each and every contact so you know which contact is send you messages from the notification light colour. With Textra you can also customize the icon color, LED color, message sound, vibrate pattern, privacy etc. Textra delivers on the publishers motto of “Simple. Beautiful. Fast.” beautifully. You can get the App for free from Google Play now and start SMSing your friends to check it out.